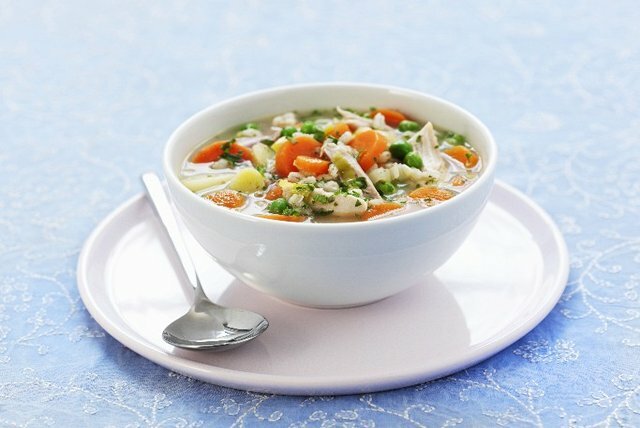 This Chicken Vegetable Soup with Orzo tastes like you spent hours making it in the kitchen. In fact, the prep time is only 25 minutes. Pretty good, huh? Heat dressing in Dutch oven or stockpot on medium heat. Add garlic; cook and stir 2 min. Add next 5 ingredients. Bring to boil; simmer on medium-low heat 5 min. Add pasta and peas; simmer 15 min. or until pasta is tender and chicken is done (165°F). Remove and discard bay leaves. Remove chicken; cut into bite-size pieces. Return to soup along with the parsley; stir. Cook 1 min.